Freddys Escape House is a fun game with a twist, in which you must open each door by a certain movement of your mouse. Now you can enjoy this game online free. There will be a visual lead for you to teach how to move your mouse but try to be as careful as you can, for if you mess the move, you have to start the game from the beginning all over again. There are some scary items involves in the game, so remember that if you like to play in the night. As always, good luck and have a good time. Share this game if you enjoyed this game. 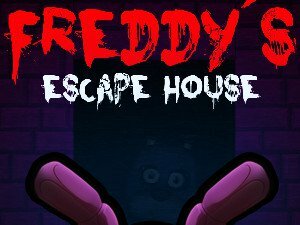 You can play Freddys Escape House free online shooting games at fogames. It has tags: Action,Html5,Escape. It has 2677 total plays and has been rated 86.3% (47 like and 17 dislike), find the fun and happy day. If you want to play more shooting games, we find some of the game: Beach House Escape, Action Escape Kitty, Urban Survival Escape 2 and House Of Wolves. To play other games, go to the action games page, the html5 games page, or just check out the new games or best games page. Play Freddys Escape House online games, Fun and Happy.